NOW: Jean Sherrard stands snug to the freeway overpass on Holgate Street, named for the Seattle pioneer John C. Holgate who might have appreciated such a convenient ascent to his claim on Beacon Hill. The “revelator” here is the hole on the right. From the guardrail on Holgate Street we get a somewhat rare look down into the old tideflats, or nearly so. A lot has already been dumped in that hole, but far from enough to yet fill it. In Jean’s “now” it is as high as Holgate and sturdy enough to support trucks. 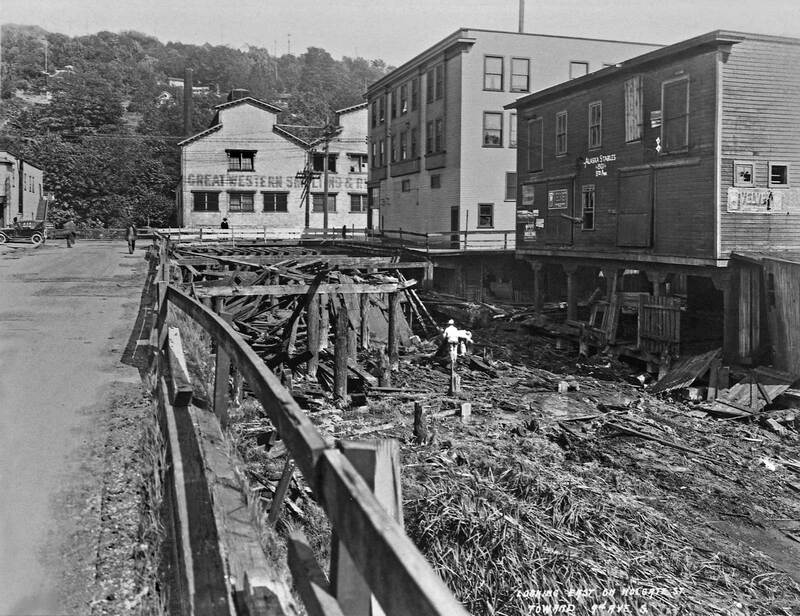 Buildings now stand on concrete foundations and not on driven pilings like those supporting, at the 1923 scene’s center, the 45 steam-heated rooms of the Holgate Hotel, and the Alaska Stables, far right. surviving “inland piers” are partially outlined in white. As the Seattle Times advertisement printed above reports, its Feb. 12, 1905 edition – and many more – were printed from plates using Great Western Smelting and Refining Co.’s metal. 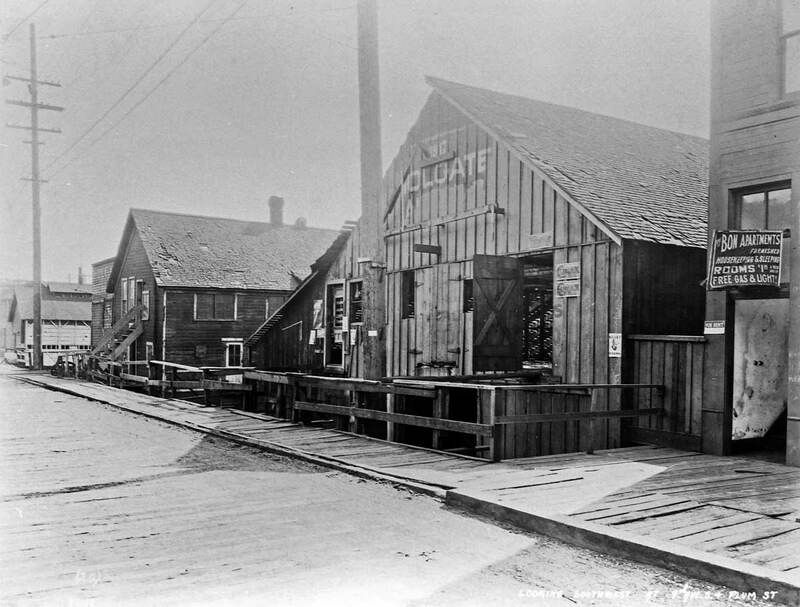 The Seattle branch of Great Western was housed here, one door south of the Salvation Army’s Industrial Department, in these wharf-like sheds. Above: Looking east across 9th Ave. S. with the north facade of the Great Western factory on the right. The photo is date 1923. A year later the Salvation Army’s Industrial Dept. has moved to 914 Virginia Street and 406 12th Ave. S.. Possibly the reclamation work on 9th Ave. S. had something to do with the moves. Below: Like the subject above, this was also recorded on May 22, 1923 and includes on the right the south facade of the Great Western factory. The largest structure on the left – on the west side of 9th Ave. S. south of Holgate Street – is the Holgate Hotel. The two story darker box to the south of the Holgate is the Bon Apartment House. 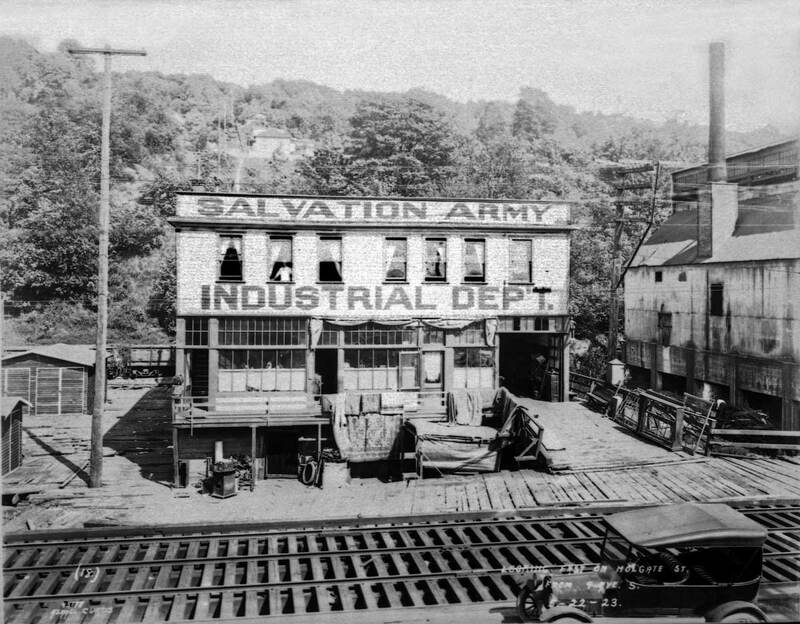 This Curtis was taken from the trestle that reached 9th Ave. S. from the Great Western factory and looks north with the Salvation Army on the right. it is not dated although surely sometime in 1923. I suspect that the reclamation is already underway here and that the tidelands showing are getting an early flooding of salt water enriched with mud blasted further north from the sides of Beacon Hill. 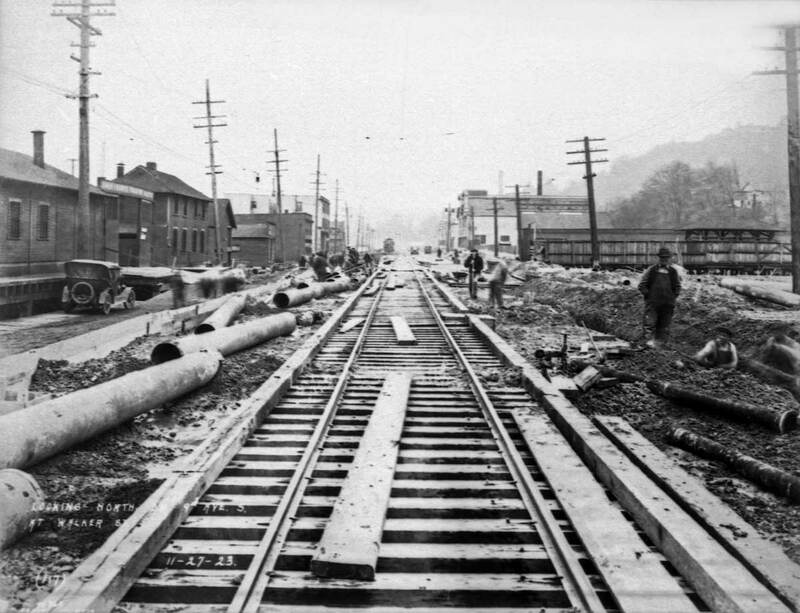 Airport Way’s first incarnation was in the early 1890s as a 24-foot wide plank trestle called Grant Street. 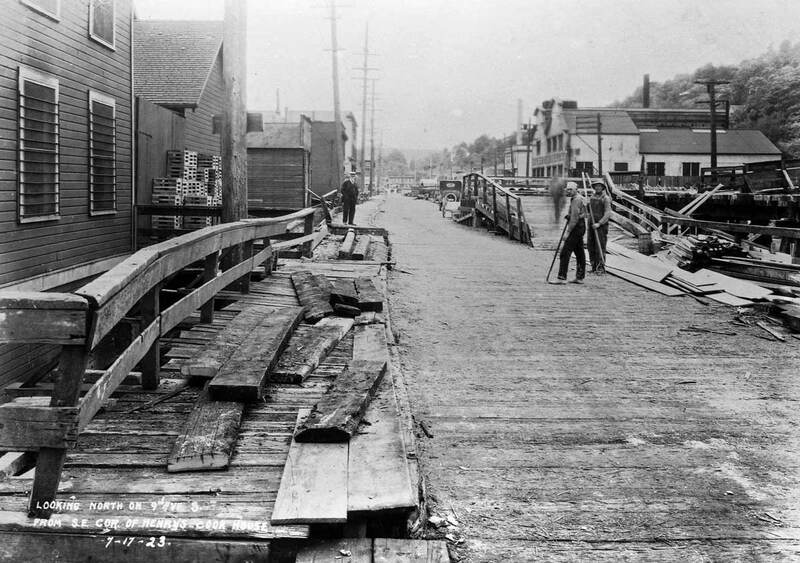 Approaching the business district at its north end Grant was given the grander name, “Seattle Boulevard.” For the most part, it ran a few feet off shore from the often-sodden Beach Road that was first surveyed in 1862 at the base of Beacon Hill. (In the winter travelers took to the hill.) 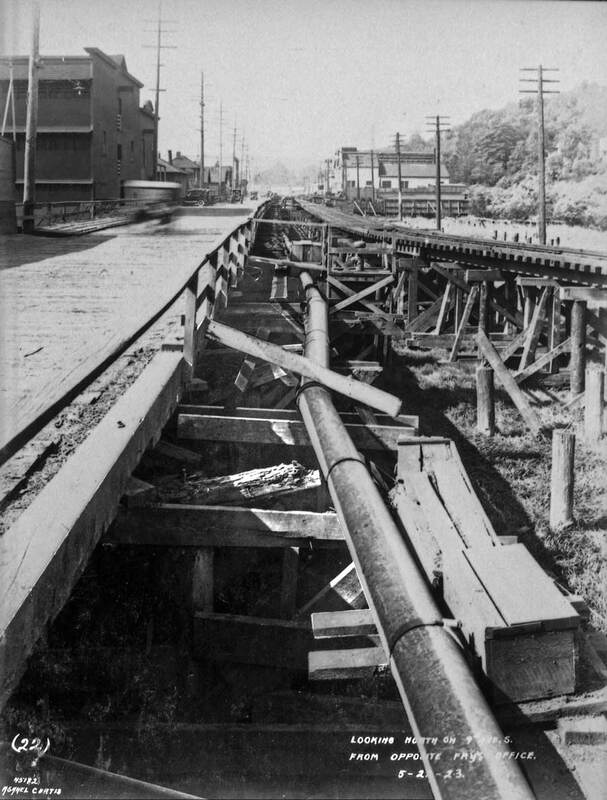 The trestle was soon joined in 1892 by the Grant Street Electric Railway that reached its power plant in Georgetown and beyond that South Park too. Already in 1919, the Alaskan Stables, far right, began running in The Times classifieds under “Livestock” its horses, harnesses and saddles for sale. By then the sounds of trolleys, trucks, and motorcars were readily heard on Seattle Boulevard. Here the great sliding door into the stables is closed above the hole that was once no doubt covered with the stable’s own timber trestle. As you know, Paul, the blog has been plagued with server problems which recently seemed to grow exponentially. We have, however, made alternate plans which we hope to put in place over the next week. There may be some downtime, but it should be temporary and certainly shouldn’t be any worse that the interruptions we’ve already encountered. So onwards and upwards! Anything to add, Paul? Yes Jean. First and directly below Ron Edge (of the sometimes Edge Clippings Service on this blog) has put up three links to other features from this tidelands neighborhood, or nearby it. They may be familiar for two have appeared here recently. But, again, we treat these now-then repeats as themselves repeatable – like musical themes used in different contexts. 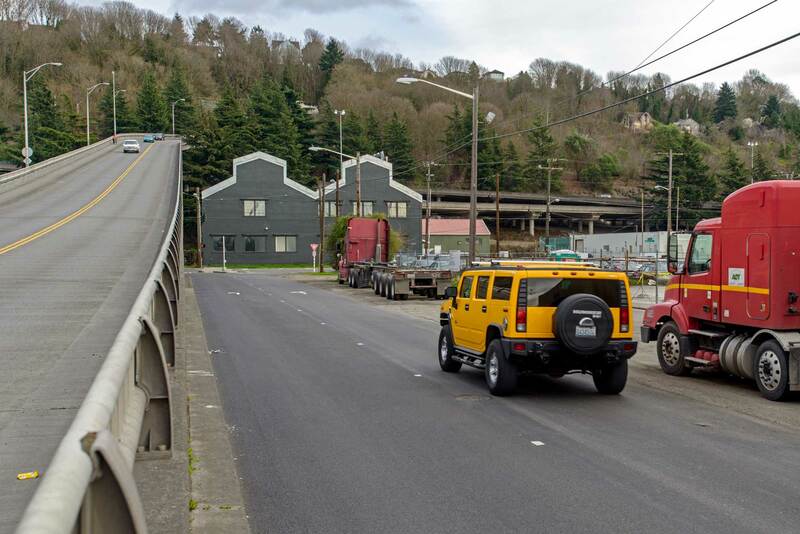 Following these pictures-as-buttons I’ll put up a few more Asahel Curtis photos take for this project of raising the tidelands to the level of the streets, here on 9th Ave. S. (aka Airport Way) and connecting streets like Holgate. And then I’ll reread the text at the top and revisit my notes to see if there may be something in the latter that will add to the former. FOLLOWS more photos by Asahel Curtis – or his studio – of the public works on 9th Ave. S. in 1923. Another look north on 9th Ave.S. on May 22, 1923. 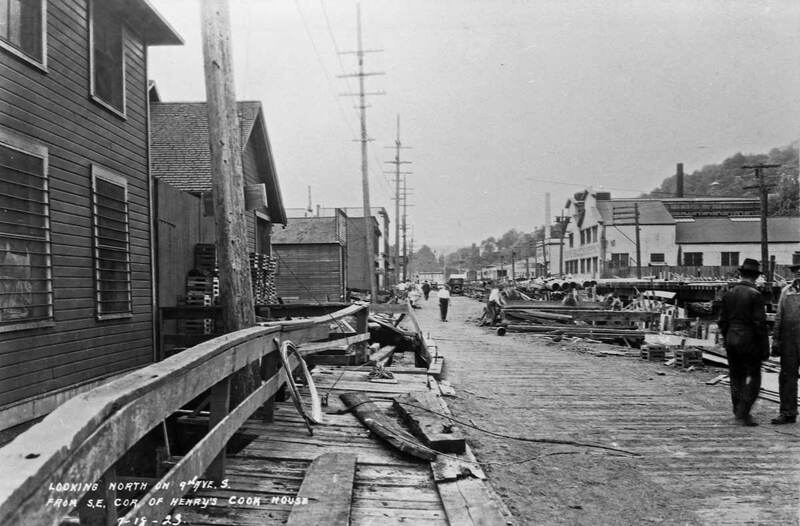 The trolley line on the right and the “wagon road” on the left, between them a pipeline that is most likely installed to help in this tidelands reclamation – giving 9th Ave. S. a platform of high and dry dirt rather than a trestle over tides. The Great Western factory at the Beacon Hill foot of Holgate Street is right-of-center. ABOVE AND BELOW: Two by Curtis looking north on July 19, 1923 from, the captions explain, from the southeast corner of Henry’s Cook House. 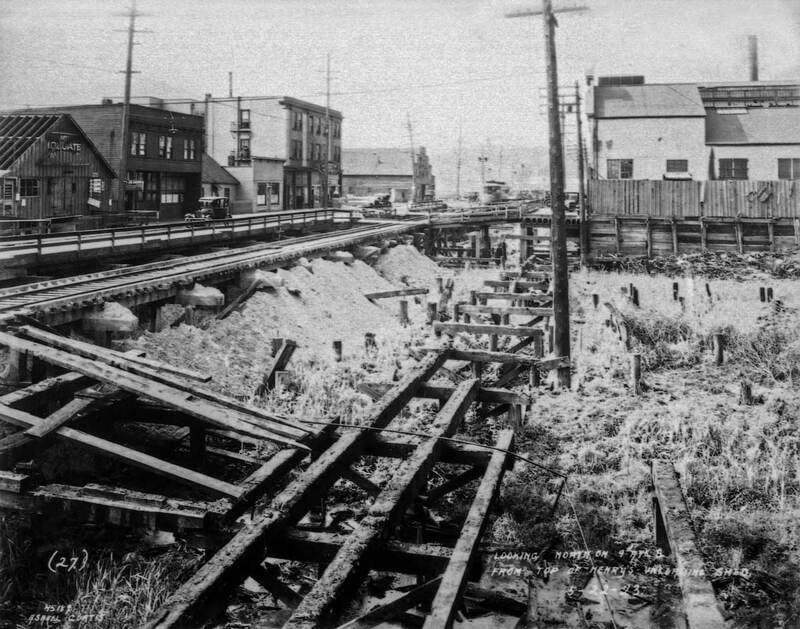 Dated Nov. 27, 1923, and so later than the rest, the fill seems to be here mostly in place both west and east of the trolley tracks now bedded in dirt. The pipes on the left may have done the work – in part. Both the Great Western factory and the Holgate Hotel appear about two block north on 9th. As the caption indicates, this view looks north from Walker Street, or near it. 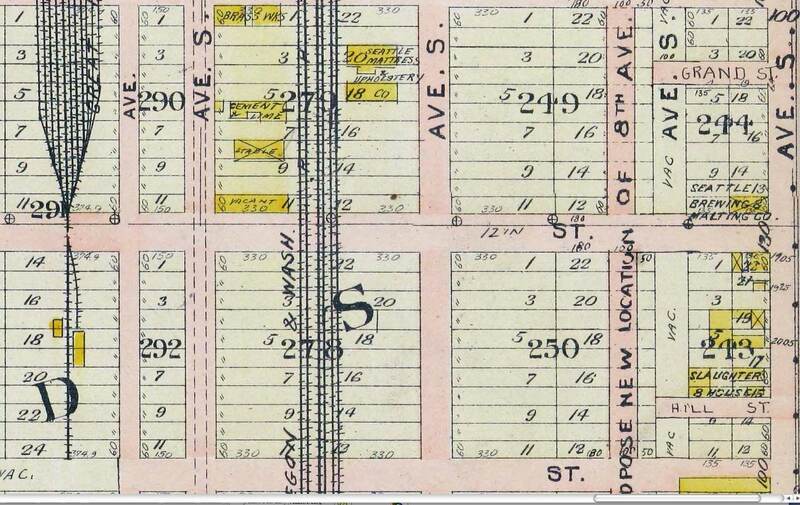 The neighborhood around 9th Ave. S. and Holgate Street, to the east of 9th, from the 1912 Baist Real Estate Map. This is a fine confession of the errant grandeur of real estate maps. Holgate in 1912, of course, did not climb Beacon Hill as shown here. It still doesn’t, but requires a curve. 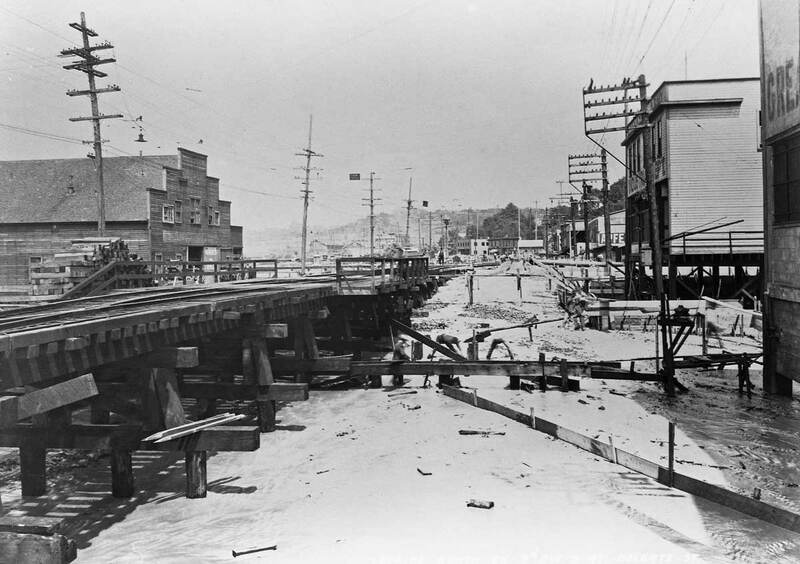 Holgate and the tidelands to the west of 9th, again or still in 1912. 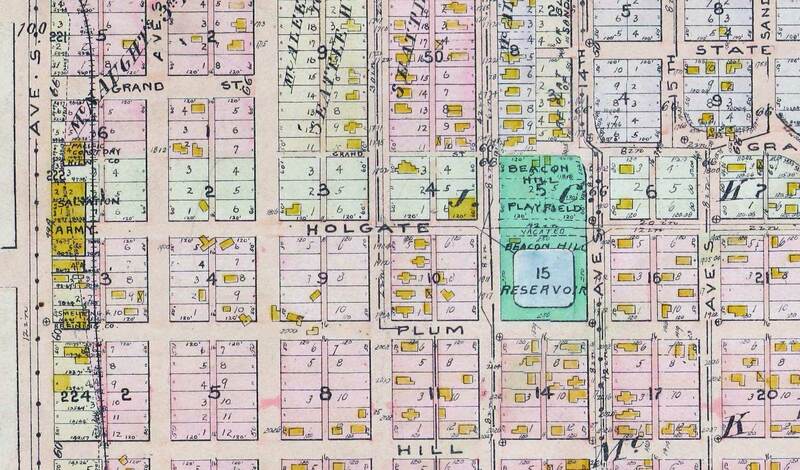 * John Holgate made the first potential settler’s footprint on future Seattle soil in 1850 when he visited that summer and built a lean-two somewhere near the future Pioneer Square – or Place. He explored the surrounds until October and then returned to Portland and beyond to promote Puget Sound to his family and look for a wife. When he returned the land he had chosen beside the Duwamish River and near its mouth had been taken in the interim and so Holgate substituted a claim on top of Beacon Hill and in line with his future namesake street. 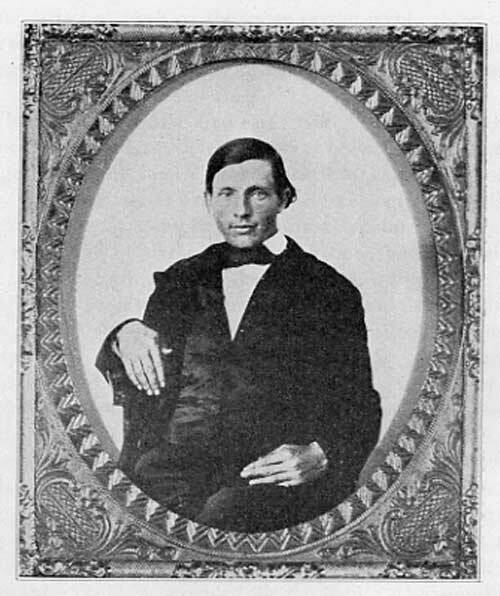 Holgate’s younger brother Milton also settled in Seattle, tragically. The teenager was one of two settlers who lost their lives during the Battle of Seattle on Jan 26, 1856. * Great Western Smelting and Refining Co. came to Seattle in 1903, but not directly to this factory on 9th Ave. S., although nearby. The first factory was at First S. and Connecticut until a roof fire uprooted them. An adver. for March 3, 1912 puts them at 1924 9th Ae. S., The 1924 Polk Directory listing for Great Western makes note that the city directory was printed on metal GW metal. By 1928 the business has changed its name to Federate Metals Corp and continue to note that the printing of that year’s business directory was done with plates furnished by Federate.